Excess facial fat is a concern for many people, particularly in the area under the chin and on the neck. Submental fat, a condition commonly called a “double chin,” can be the cause of self-consciousness for both men and women. In the past, the only cosmetic option available to address this issue was surgery and procedures such as liposuction. 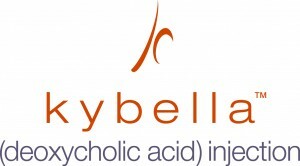 However, a new, FDA-approved non-surgical treatment called KYBELLA is now available. 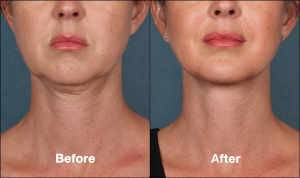 This injectable technique is designed to dissolve fatty tissue under the chin with long-lasting results. Dr. Richard Zeff, our board-certified plastic surgeon, now offers this innovative procedure at our state-of-the-art practice. If you would like additional information about KYBELLA, or if you would like to schedule a consultation, please contact us today. As the first and only FDA-approved treatment designed to specifically address excess fat under the chin, KYBELLA offers a multitude of benefits. The minimally invasive procedure can be completed quickly, often in as little as 20 minutes. Furthermore, Dr. Zeff will customize the treatment plan to suit your needs and goals, helping you achieve the facial contour you desire. Additionally, you should have reasonable expectations for the outcome, which our plastic surgeon can discuss with you. Submental fat can be diet- and exercise-resistant, which means that even individuals at a healthy weight will often suffer from this condition as well. If you’re experiencing excess fatty tissue under the chin, KYBELLA may be able to help you beautifully recontour your profile. KYBELLA is administered through a series of targeted injections into areas under your chin. Dr. Zeff will explain which regions can be effectively treated based on your anatomic needs and expressed goals. Most patients have reported that the procedure involves minimal discomfort. The treatment typically takes around 20 minutes, though individual experiences vary. For optimal improvement, two or occasionally more treatments will be necessary, and generally they are spaced approximately one month apart. Results of KYBELLA should be long-lasting. Tenderness, swelling, bruising, and mild numbness are common side effects following the procedure and should subside within a few days, although bruising may take slightly longer to disappear completely. Most patients feel comfortable returning to work in a day or two. Between two and four treatment sessions may be necessary to obtain the desired outcome. Individuals who have significant skin inelasticity as well as fatty tissue under the chin may benefit from a different approach. This is due to the fact that KYBELLA is not designed to tighten or firm the skin. Your comfort, safety, and results are our highest priorities, and we will strive to make your experience as pleasant as possible. $1,200 for second vial on same treatment day. Wondering if KYBELLA can help you achieve your cosmetic goals? Contact us today to schedule a consultation. Our friendly and knowledgeable medical team looks forward to answering any questions you may have.